University of Delaware professor Douglas Tallamy wrote in his book, “Bringing Nature Home,” that gardeners have the power to encourage wildlife and sustain natural ecosystems. How? By including native plants in their landscapes. 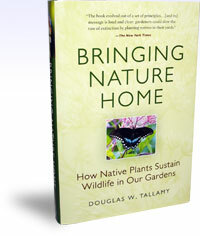 Tallamy, profiled recently in the New York Times, will be one of three speakers at “Native Plants to Beautify Your Garden and Sustain Our Ecosystem,” a symposium to be presented Nov. 1, 2008 by the Hardy Plant Society of Oregon. It will be at Portland Community College, Cascade Campus (map/directions). Doors open at 8:45 a.m. for community resource partner displays, book sales and botanical displays. The program starts at 9:30 a.m. Other speakers include Gail Dresner of Circadian Consulting & Design, and Diana Reeck, plant explorer/breeder and co-founder of Collector’s Nursery. The cost is $25 for the public and $20 for HPSO members. For more information: www.hardyplantsociety.org. Here’s the program flier (PDF). You can register online.